Consumers are increasingly going for larger screen sizes when they purchase a new TV, according to new data from industry analyst firm IHS Markit. The data, which covers gobal shipments of TVs in the third quarter, revealed that the average screen size of models purchased in the three month period rose further than in any previous quarter over the last year. IHS Markit said worldwide shipments of TVs with 60-inch or larger displays grew by 40 percent in the quarter, which is 10 percent higher than in previous quarters this year. North Americans had the biggest appetite for larger displays, being wooed by reduced prices for 65-inch and 75-inch TVs as brands introduced early promotional deals ahead of the holiday season. That resulted in the average sales price of a 65-inch 4K LCD TV in the U.S. dropping to just $1,100 (£864), down from $1,256 (£987) in the previous quarter, the analyst firm said. “Each year during the holiday shopping season, brands and retailers try to push ever larger screen sizes to keep revenues growing and encourage adoption of value-added features like 4K and smart TV,” said Paul Gagnon, research and analysis executive directors at IHS Markit. That strategy appears to be working, as another analyst firm, Futuresource Consulting, last week said it expects shipments of 4K TVs to hit 100 million by the end of the year. That number seems to tally with IHS Markit’s own figures, which show that 4K TVs now account for 44 percent of the overall market. And in monetary terms 4K’s share is even bigger, accounting for 71 percent of all TV revenues in the third quarter. Sales of 8K TVs were less than spectacular however, and although it didn’t report any numbers, IHS Markit said last month it’s expecting less than 20,000 of these models to be shipped in 2018. However, the forecast for 8K is much brighter in 2019, with more than 400,000 models expected to ship as more native 8K content comes available. 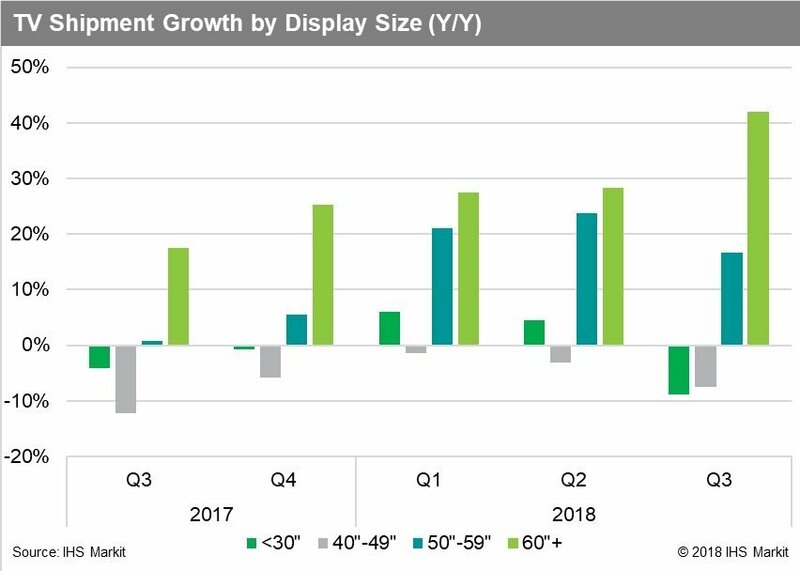 With regards to display technologies, IHS Markit said LCD TV shipments grew by 14 percent in the quarter, while shipments of quantum dot LCD TVs with screen sizes larger than 60 inches rose to 663,000 units. OLED TV shipments fell slightly in the quarter, but once again buyers are seeking out larger models as the share of 65-inch TVs in this category grew to a record high of 38 percent.